Stretching from Liguria in the west to the Po Delta and the broad Adriatic beaches in the east, Emilia Romagna is a gloriously understated region of medieval cities and seaside resorts, minus the crowds that tend to head for neighbouring Tuscany and the Veneto. Boasting Renaissance palaces, Byzantine artworks and a memorable foodie heritage, Emilia Romagna is, for many, Italy at its very best. Geographically, the region is quite varied. In the north, while less exciting visually than the forested Apennine peaks to the south, the flat farmlands of the Po river are the source of the region’s gastronomic delicacies of Parma ham, parmesan and balsamic vinegar. The region is also one of Italy’s greenest, boasting two national parks, 14 regional parks and 15 nature reserves. On the eastern fringes, the region’s 110 km share of the Adriatic Coast ranges from the sprawling Po Delta national park to many miles of sandy beaches lined in summer with orderly rows of sun loungers and umbrellas. Famous people linked to the region include the composer Giuseppe Verdi, the poet Giosuè Carducci and the motor racing driver Enzo Ferrari. 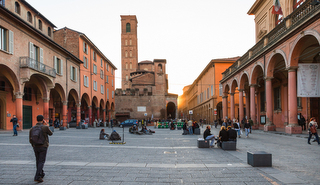 The regional capital of Bologna is a good starting point but the smaller towns of Parma, Piacenza, Modena and Ferrara are equally worth visiting, boasting architectural treasures that date back to their former rule by powerful local dynasties. 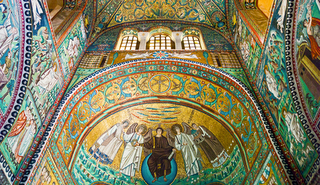 Ravenna remains the jewel in the crown and a highlight of our Northern Tuscany and Ravenna tour. For nature enthusiasts, the Po Delta Park is one of Europe’s most important wetlands, easy to explore on foot or by bike along a range of trails. 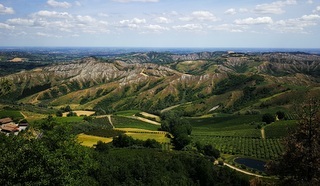 For a more varied landscape, the Alta Via footpath, which travels through the Apennines in Emilia Romagna, Tuscany and Le Marche, offers up to 500 km of slopes interspersed with lakes, forests and rivers. The region is synonymous with some of the most iconic names in the motor industry and Ferrari, Lamborghini, Maserati and Ducati are all manufactured in Emilia-Romagna. Choose from an extensive list of public and private motor museums, including the Ferrari Museum in Maranello (Modena), the Museo Ducati (Bologna), the Museo Lamborghini (Sant’Agata Bolognese, Bologna) and the Museo Nazionale del Motociclo (Rimini). Visits to private collections generally require pre-booked appointments. This is a region where food is king. 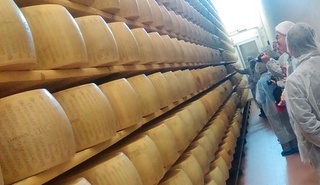 Parmigiano Reggiano cheese, Parma ham, balsamic vinegar from Modena and mortadella from Bologna are just a few of the culinary highlights and guided tours to find out more about the production of any of these items are highly recommended. 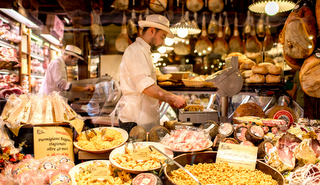 In local restaurants and trattorie, feast on egg pastas with rich meat sauces, plump tortellini and ultra-lean culatello ham, washed down with a sparkling local Lambrusco. As well as the Lambrusco other native grape varieties include the white Albana, and red Ancellotta, and Sangiovese. For the ultimate foodie experience, try the tasting menu at the Michelin-starred Osteria Francescana in Modena, winner of numerous accolades. The world’s oldest university, its own leaning tower and an exquisitely preserved medieval centre are just some of the reasons for visiting Bologna but its nickname of La Grassa (The Fat One) gives you a good indication of another of the city’s attractions! Work up an appetite climbing the 498-stepped Torre Asinelli to get an overview of the red-roofed streets, wander through its arcaded streets (666 porticos in total) or past the designer labels along the Portico Cavour and pause for a cappuccino in one of the city’s magnificent piazzas. 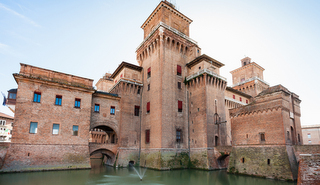 Slightly off-the-beaten track, the UNESCO World Heritage city of Ferrara is home to Renaissance palazzi and one of Europe’s oldest Jewish ghettos. Ruled by the impressive Este family in Renaissance times, the city’s two most striking buildings are the Castello Estense and the Duomo. The city is a must for anyone who has read Giorgio Bassani’s The Garden of the Finzi-Continis or his other Ferrara-based novels. 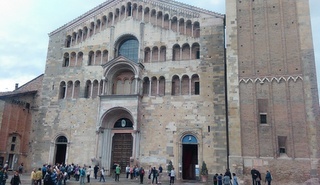 Aside from Parma’s food tours, there is a splendid Romanesque Duomo and an octagonal pink marble baptistery which is one of Italy’s finest medieval buildings. The National Gallery, housed within the 16th century Palazzo della Pilotta, has examples of work by Correggio, born in Parma and one of the great painters of the high Renaissance. Other highlights include a unique astronomical clock on the north side of Piazza Garibaldi and the baroque Teatro Farnese, created entirely out of wood. 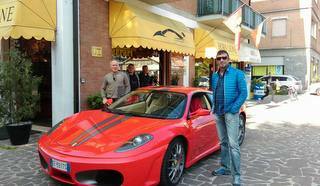 Cars and tasty treats are just part of the story in Modena. The Cathedral, Piazza Grande and the Ghirlandina Tower have all been awarded UNESCO world heritage and the home of locally-born Pavarotti has been made into a museum. Of the many charming villages in the region, Brisighella is one of the prettiest. Situated close to Faenza, the medieval town is made up of ancient lanes and streets, the most famous of which is the raised and covered Via del Borgo (also called Via degli Asini) which was used to transport chalk, via donkey, from the quarries. The street is overlooked by the former donkey stables, now private homes. 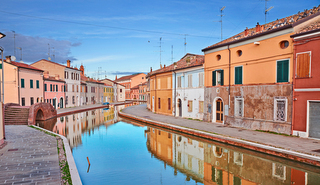 Comacchio, a picturesque fishing village criss-crossed by a series of canals, is also worth visiting. The former capital of the western Roman empire, Ravenna remains one of Italy’s less crowded tourist attractions, despite its extraordinary mosaics. 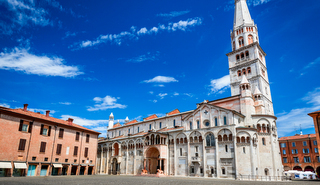 Read our Ravenna Blog to learn more about the city's outstanding monuments. · Take in an opera at the Teatro Regio, Parma, which hosts an annual Verdi Festival (October) and stages four operas every season. · Visit the University of Bologna (established 1088), its library and anatomical theatre, which dates back to 1637. · Rent a free bike from the tourist office in Ravenna to cycle round town or out to the tiny village of Classe to admire the vast Basilica di Sant’Apollinare. Did you know? Ravenna was the final resting place for Dante who completed the Divine Comedy whilst living there and was the subject of a lively debate between Ravenna and Florence as to where he should be buried. While many flock to Dante’s imposing memorial in Florence’s Santa Croce, his remains lie in the small chapel connected to the Basilica di San Francesco in Ravenna. 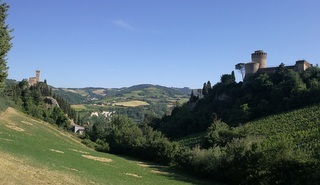 Our Northern Tuscany and Ravenna tour travels from Bologna to Ravenna, incorporating hikes in the Mugello and a visit to Brisighella; while our Parma Tuscany and Ligurian Sea tour travels down from Parma, along part of the ancient Via Francigena, to Lerici on the Ligurian Coast. International flights are available to Bologna, Verona and Venice airports. Further information on the region from the Emilia Romagna Tourist Board.